Upcoming farmers’ market in the 12th arr. I’ve mentioned my love for Paris markets many times. While the weekly farmers’ markets are always worth visiting; I especially enjoy the special markets for produce and items from around the country. There’s a Marché des Producteurs de Pays scheduled for May 22 and 23 in the 12th arr. It’s conveniently located between metros Daumesnil and Dugommier. Keep an eye out for socks and blankets from angora sheep, dandelion wine, sheep’s milk soap, regional cheese and cookies, and buy a hunk of bread from the 3 feet wide circles. I love the Marché des Producteurs de Pays in Paris. This is your opportunity to buy products directly from the farmers, artisans, and craftsmen from around the French countryside. I especially like the angora socks, aligot, candles, and specialty baked goods. You’ll also find great deals on holiday presents, such as local wine, cheeses, and hand-crafted goods. The next market will be November 21 and 22 in the 12th arr. on Boulevard de Reuilly. This is a good sized market and you should find plenty of goodies to eat and enjoy. 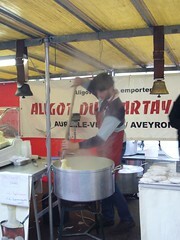 Don’t miss the Aligot festival this weekend in the 12th arr. near Park de Bercy. To be fair, it’s not just aligot but also a celebration of the Aveyron region of France. The Marché des Pays de l’Aveyron festival takes place October 9-11, right in front of my favorite cafe, the Parisian Sweet Bar. Aligot is a stringy white cheese that is laboriously stirred with potatoes to create a heavenly, yet very filling dish. It’s a rich mashed potato dish that makes even the sturdiest potluck bowls of Alabama pale in contrast. After all, the region is known for its hardy, rustic cuisine. This is also a great time to sample and purchase confiture, honey, and other local products. I always keep an eye out for socks and other items made from the Angora goats. These regional festivals are perfect for tourists in Paris that are looking for a quick shopping/eating excursion. Wine lovers can find wonderful bottles that are impossible to find back home. They are free to join and you can expect ample samples and smiles. Just try to look past the fois gras, sausages, and other meaty products. I will be leaving Paris in August, 09. My employer is shutting down their engineering in the Paris office and I’ll be heading back to California. I’m trying to make the most of the remaining weeks, mostly by leaving the city and visiting other countries in Europe. I’ve been saving magazines and web sites for places I’d like to visit before I leave. i’ve been meaning to make a list that I can update as needed. This seems like as good a place as any to start it. Rungis market, the largest market in Europe. It’s a massive distribution center for all kinds of produce, cheese, meat, and fish from around the world. This is where restaurants, market sellers, and stores go to get their supplies. It’s open to the public, but fruits and vegetables are only sold on week days.I will be visiting Rungis soon with the owner of Paris Sweet Bar cafe as a guide. Dans Le Noir: the restaurant where you eat in total darkness. L’Atlantide: supposedly the best couscous in Paris. I’ve been told they have good vegetarian options. Fall is in the air and tourists to Paris can’t help but think about what to bring back as gifts for the holidays. Paris has no shortage on shopping; but where could you find something a bit more unique than an Eiffel Tower key chain or Mona Lisa t-shirt? November 22-23, Boulevard de Reuilly, 12th arrondissement (metro Daumesnil). December 5-7, St. Paul village court. This is a bit harder to find. Take the St. Paul metro and go behind the St. Paul church. Honey and Confiture: Nothing brings back local taste than regional honey and preserves. David Lebovitz has a great article about Honey in Paris. For confiture, check out your local markets, the Marchés des Producteurs de Pays, and also stop by a nice fromagerie to see if they offer a confiture de la maison. I buy my coffee and confiture from Pascal Guiraud, in the 12th Arrondissement on Blvd de Reuilly. Macarons: It’s hard to go wrong with a great box of macarons from Pierre Hermé or Ladurée. 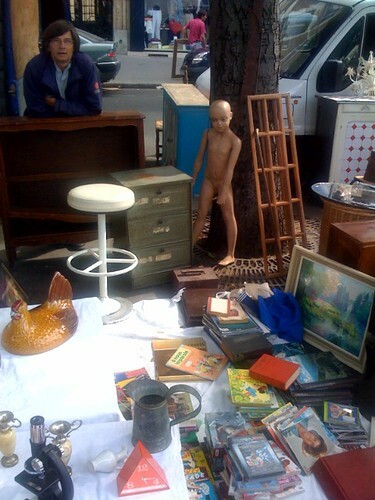 Flea Markets: Everyone has heard about the famous Paris Marché aux Puce. It’s enormous and sits in the north border of the city. Frankly, it’s overpriced and you could spend all day looking and not buy anything. However, there are several smaller flea markets that are more promising. I personally prefer the one at Porte de Vanves. It is every Saturday and Sunday from about 8 a.m. to 2 p.m.. Dress warmly for the winter shopping, some areas are always in the shade and it can get chilly. Look for inexpensive art (etchings and prints), glassware, jewelry, and household items. You’ll find your best bargains at a Vide Grenier (community garage sale). Keep an eye out for fliers around the city for the local sale. They are not always available. This is just a short list of places to get gifts for friends and coworkers before heading home. Look for the locally produced and regional cuisines wherever you travel. They’ll be more memorable than the standard souvenirs. Pain, Vin, Fromages – the name says it all.